Palaniswami also assured that a protected drinking water supply scheme for Namakkal will be implemented, sourcing it from Cauvery. 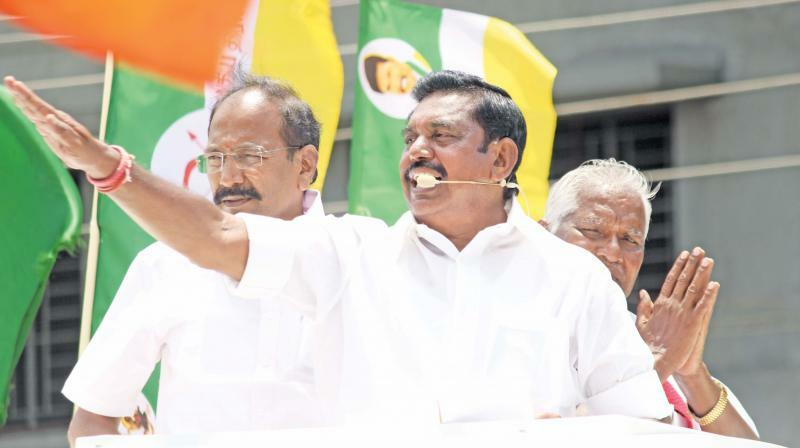 Campaigning for AIADMK’s Namakkal parliamentary constituency candidate, Mr. Kaliappan here on Thursday, Mr. Palaniswami warned that Stalin should mind his language. “If we start replying to his (uncivil) manner of speaking, their ear drums will rupture,” the Chief Minister said in an aggressive campaign in the Kongu belt. Mr. Palaniswami faulted the Kongu outfit, KMDK candidate, contesting Namakkal as part of DMK-led front, for contesting in DMK symbol ‘Rising Sun’. “How can KMDK candidate contest on another party’s symbol without being a member of that party,” he asked, adding, whether KMDK man had become a DMK member. Refuting Stalin’s allegation that the AIADMK government refused to give a piece of land on Marina sands for laying to rest the mortal remains of the late DMK leader M Karunanidhi, the Chief Minister said the state had offered land in government estate where the Kamaraj memorial is situated. Mr. Palaniswami also assured that a protected drinking water supply scheme for Namakkal will be implemented, sourcing it from Cauvery. Other river linking projects like Godavari-Cauvery link-up will also be taken up by putting pressure on the new Central government if BJP was returned to power, he said. Later, Palaniswami left for Salem to campaign for AIADMK candidate Saravanan there.